By: Robert J. Green Jr., N.D.
Acupuncture has been an integral component of traditional Chinese medicine for over 5,000 years. In addition to acupuncture, traditional Chinese medicine also has its own complete system of herbal medicine. Although Chinese immigrants brought acupuncture to the United States in the mid-nineteenth century, it did not establish itself as a distinct form of healthcare in this country until about thirty years ago, and it has only been in the last seven or eight years that acupuncture finally gained recognition from the mainstream medical community as a viable means of treatment for a variety of health conditions. Acupuncture�s reputation, though, amongst the American public has been somewhat limited in that it is mainly thought of as a means to help with either the treatment of addictions or the management of pain. However, as more and more of America�s savvy health consumers continue to investigate and educate themselves on natural and alternative medicine, more and more of the population is becoming aware that acupuncture can be successfully used as either a main therapy, or an adjunct therapy, for a whole myriad of health issues besides pain management or addiction treatment. The recognition and acceptance that acupuncture now enjoys in America can all be credited to acupuncture�s consistent effectiveness. In particular as it pertains to COPD, there is enough clinical evidence to warrant the use of acupuncture in COPD. Acupuncture has been clinically shown to reduce shortness of breath, improve one�s ability to walk, and to improve pulmonary functions testing, to include FEV, RV, and TLC. The use of acupuncture in COPD also contributes to a significant overall improvement in quality of life. In some instances, acupuncture may even help to improve one�s condition enough such that pharmaceutical medications may either be lessened or possibly eliminated altogether. Traditional Chinese medicine is based upon the principle that energy (qi or chi) in the body flows along a series of channels, known as meridians, that run throughout the body. When an individual is healthy, energy is flowing in a balanced manner along these meridians or channels. Consistent also with the concept of energy flow is that when a person is experiencing a diseased state, it is because the energy flow along the meridians has become blocked or disrupted. Acupuncture involves inserting very fine needles into the skin at specific points that lie along these meridians so as to help rebalance the flow of energy (qi or chi) and promote health. When performed by a licensed acupuncturist, acupuncture is essentially safe. Some individuals may occasionally feel a slight sensation of pain or bleeding at the needle site, but for the most part, when it is done correctly, acupuncture does not hurt. By using sterile disposable needles, which is for the most part the standard of practice today, infections will be avoided. Appendix 3 contains contact information for the American Association of Oriental Medicine, the Acupuncture and Oriental Medicine Alliance, the National Certification Commission for Acupuncture and Oriental Medicine, and Acufinder. These organizations are all well-respected professional organizations where you can find additional information about acupuncture and traditional Chinese medicine, as well as information on finding a licensed practitioner. Acufinder, in particular, has a very useful website with a lot of general information about acupuncture as well as an extensive database of licensed practitioners. I encourage you to consider using acupuncture as an adjunctive therapy for your COPD. Acupuncture and traditional Chinese medicine are very holistic approaches to healthcare and they will complement any other natural therapeutic protocols you are using. Remember also that most acupuncturists are also trained in Chinese herbal medicine, so you will not only gain the benefit of acupuncture itself but you will avail yourself of all the health benefits that can be gained through the use of Chinese herbs. Herbs have been an integral part of the healing arts since the dawn of civilization. For thousands of years now, essentially every known culture that has ever inhabited the planet Earth has used herbs medicinally. Although herbs have an extensive history of medicinal use, there are still a few individuals within the mainstream medical establishment that either frown upon their use or just outright dismisses their medicinal worth. These individuals will usually defend their position toward herbs by asserting that herbs are not �scientifically proven� to be effective. Nothing could be further from the truth, and, once again, perspective is everything. The truth of the matter is that the medicinal properties of herbs have been �proven� when you broaden the criteria of what is accepted as the standard of proof. In today�s scientific and technologically driven world of medicine, the standard of proof for medicinal efficacy has been narrowed to the point where only the information that is derived through conventional scientific research and controlled double�blind studies is considered acceptable. Conventional scientific research is usually aimed at attempting to explain the mechanism of how a substance works fundamentally, while double�blind studies attempt to determine whether or not the substance under investigation is clinically effective and safe for use in human beings. Although current research methods are absolutely necessary in order to advance our understanding of science and medicine, and double�blind studies certainly yield much-needed data concerning a substance�s clinical efficacy and safety, I would contend that it would be very remiss of us to disregard the wisdom and knowledge of medicinal herbs that has been formulated by various cultures throughout history if it is only for the reason that many of these herbs have not been subjected to current research protocols or double�blind studies. There are many drugs that are routinely used in medicine today that may have �passed� the criteria of double�blind studies, yet the mechanism of how they work fundamentally is still not known. Not fully understanding how a drug works, however, does not necessarily stop modern medicine from using the drug. But what is to be said of the �proof� that is derived through the history of a substance being used safely and effectively for hundreds or thousands of years? I would submit that if an herb has been consistently and reliably used over the centuries because of its recognized and effective medicinal properties, then this in and of itself establishes the basis of historical �proof.� I would further submit that using the historical record of an herb to substantiate its medicinal value is every bit as legitimate as a modern double�blind study. Passing the test of history, rather than a clinical trial, is what has enabled us to know how to use any particular herb safely, effectively, and appropriately. It is encouraging to know that over the last two decades since the American public began to undergo a paradigm shift in their perceptions towards healthcare and began to embrace natural approaches to maintaining their health, the medicinal use of herbs has experienced a tremendous renaissance that is still flourishing to this day. The paradigm shift that has been occurring across America has been not only driven by a culminating dissatisfaction with the conventional healthcare system�s limitations to effectively address the myriad of health issues that confront a significant portion of the American population, but also because America has slowly and steadily become aware that the true key to addressing chronic disease lies in embracing and applying the principles and methods of natural medicine and the natural approaches to health and living. The vast majority of the American public has now come to realize that natural medicine is a very viable means by which to improve their health, and the number of skeptics within the conventional healthcare system toward the use of medicinal herbs is rapidly diminishing. In most cases the medicinal use of herbs today is still based upon their historical use, however, the herbal medicine renaissance that has been growing in America over the last couple of decades has provided the impetus for the scientific research of herbs that is now occurring in many of our university research laboratories. Much of what is being discovered through the scientific analysis and research of herbs is confirming what has been known empirically throughout history. Research is also resulting in the discovery of new applications and roles that herbs play in human health. The significant benefit of this research though, is that it has begun to present scientific explanations for the actions of herbs, which provides the credibility and justification required by the conventional medical community to substantiate their use. Unlike pharmaceutical medications, which are single isolated compounds, herbs contain many compounds. Although only some of the compounds within an herb may be responsible for giving the herb the medicinal attributes for which it is classified, you must understand that these �active ingredients� of the herb are working synergistically within the context of the larger molecular population of the whole herb that was assembled by nature. Many of the conventional drugs that are used in mainstream medical practice today are isolated derivatives of herbs. When you isolate a compound from an herb and manufacture it as a single drug, you take that compound out of its natural context, and not only do you then lose synergy but you invite all the side effects and complications that result from using an isolated compound that is not in its natural form. Aspirin is an easy example to make this point. As far back as the fifth century B.C., willow bark was known for its ability to reduce fever and relieve pain. It wasn�t until the 1800s, some 2,200 years later, that salicin, the active extract of the willow bark, was isolated and crystallized. The salicin that is contained within willow bark is what you have come to know as aspirin. It is not that aspirin is inherently bad in and of itself; it�s the notion that nature intended for salicin to exert its action within the context of the whole herb. Willow bark, when used to relieve pain or reduce fever, has no side effects. Willow bark may take a little longer to begin acting, but its effect may actually last longer, and unlike aspirin, it doesn�t cause bleeding in the stomach or have an association with a more serious health concern such as Reye�s Syndrome. Herbs, in general, are obviously not without their potential side effects, but when properly administered, the potential side effects of herbs are usually rare and significantly less serious than the common, and very often deleterious, side effects of pharmaceutical medications. It is interesting to note that the vast majority of serious illness in this country is all lifestyle related. Heart disease, cancer, stroke, and COPD (the top four leading causes of death in the United States) are all for the most part diseases of lifestyle. There is the occasional unfortunate case where one of these illnesses has struck an individual who otherwise lived a healthy life, but by and large these are diseases that are intrinsically rooted in our dietary habits and our lifestyle choices. We are as critically ill as we are because of the bad choices we have made, and if we weren�t so sick as a result of our bad choices, we wouldn�t need such aggressive medication to help us stay alive. Fortunately, though, Americans have begun to realize these things, and along with beginning to embrace natural alternatives to their healthcare, they have more importantly begun to really understand diet and nutrition as the cornerstone of health and are making the necessary changes in their eating habits so as to avert serious disease and live healthier, happier, and longer lives. Herbs can�t cure everything. The fact is that herbs don�t cure anything � your body is the only thing that can cure itself. Herbs, however, like supplements and other natural health methods, when given an optimal environment in which to work that is predicated upon proper dietary and nutritional modifications, are remarkably effective at helping the body along in its quest to heal itself. 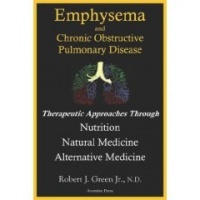 On the pages that follow, you will become acquainted with the specifics of how herbs can be used to help with COPD. The herbs that are useful for addressing the issues of COPD and building up your health are abundant. I encourage you to take full advantage of the rich herbal tradition that has served humanity throughout the centuries. Robert Green Jr. is a traditional naturopath, health researcher, and an author. He received the Associate of Arts (A.A.) degree in liberal arts from San Diego City College, and the Bachelor of Arts (B.A.) degree from San Diego State University. At San Diego State University he majored in religious studies and minored in human biology and pre�medicine, and throughout his academic life he has continuously studied the areas of mathematics, physics, chemistry and biochemistry, cellular and molecular biology, and the health sciences. In 1994 he began to study nutrition along with natural and alternative medicine in an effort to help his father who had been diagnosed with laryngeal cancer and chronic obstructive pulmonary disease. Following graduation from college he attended medical school, and ultimately completed the doctor of naturopathy (N.D.) degree through Trinity College of Natural Health. Trinity College of Natural Health, located in Warsaw, Indiana, is accredited by the American Naturopathic Medical Accreditation Board, and is one of America�s leading nontraditional colleges of nutrition and natural health that seeks to preserve the knowledge of natural health principles and techniques that have served humanity throughout the world. Dr. Green is board certified by the American Association of Drugless Practitioners as a holistic health practitioner, and he also holds board certification as an alternative medical practitioner by the American Alternative Medical Association. In keeping with his commitment to the highest ideals of scholarship, and to further understand the molecular and biophysical bases of health and disease, Dr. Green continues to study current research findings from the two main areas of investigation within the biological/health sciences and natural/alternative therapeutics: basic science research that is aimed at elucidating underlying molecular, cellular, and systemic mechanisms of health and disease, as well as clinical research efforts that are demonstrating the greatest promise toward being efficacious in bringing about positive changes in human health.